How did you come up with the idea to make QuickSilverHair Clay? 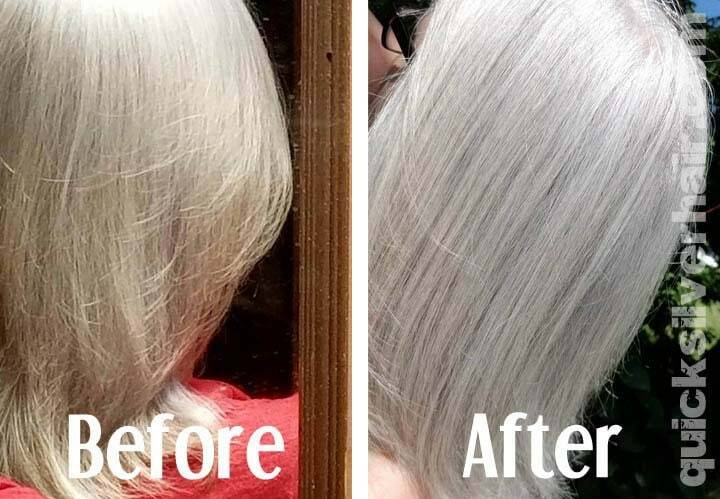 It started with one question: could the yellowing and discoloration on silver hair be removed? As those of us who are embracing our silver well know, it can become yellow, dingy, lackluster, and sometimes lose volume. The answer to this issue is usually to use purple shampoo. I had a few issues with purple shampoo though: it only covers up the discoloration, it is a dye and I had left dye behind, and most purple shampoo left me feeling itchy. In addition, by the time I had finished my Curly Girl Routine, I had washed it all out, and could not tell it had done much for me. This all got me thinking there had to be a better way. These issues led me to the question: could the discoloration be removed? I started doing research on ways to remove the discolorations without bleaching or stripping the hair. For me, I wanted something natural and easy to use. I began researching clays, as I knew clays had some amazing properties of detoxification, adsorbing impurities, and removing stains. I found kaolin clay in the naturally curly community being as a clarifying treatment. 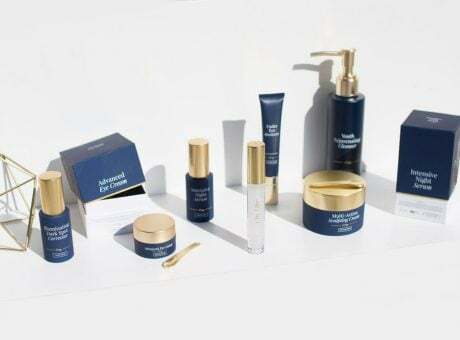 What made you decide to start your own company for gray hair products? 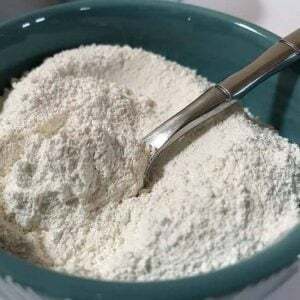 Once I had tinkered around in my kitchen with different hair mask recipes using kaolin clay combined with clarifying products, coconut oil, and several other ingredients I created what I felt was an effective recipe and gave it a go. I took some before and after pictures—the result was immediately noticeable. I shared my findings with The Silver Circle on Facebook. The response: where do we get this product? I offered to make a batch of sample product; I sold out in two weeks. It was only natural for me to engage my entrepreneurial spirit and run with it. My primary business for the last few years has been working with womenpreneurs building their brands, their websites, and social media presence. For the last 25 years, I’ve also been apprenticing and working with my mom in her natural health business which includes product manufacturing. This background gave me the confidence and vision to produce a product I felt the silver hair community needed. After some discussion and lots of support from my husband (aka. manufacturing assistant), we decided I should give it a go. What are your products and what benefits do each of them provide? 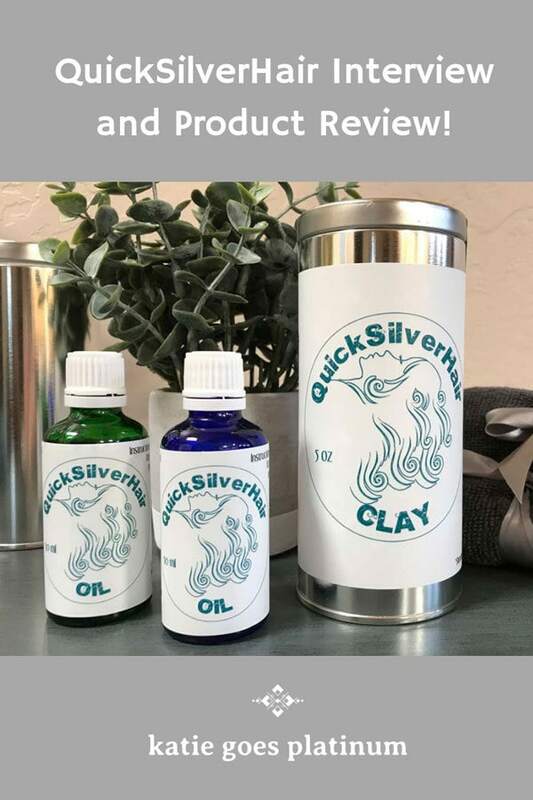 QuickSilverHair Clay is made primarily of Kaolin Clay and essential oils. The magic of the clay is that when mixed with oils and a good quality all-natural conditioner it makes a beautiful frosting-like mask that detoxifies your hair without stripping it. The clay mask adds shine, reduces frizz, softens hair to an almost silk like feel, and even adds volume. 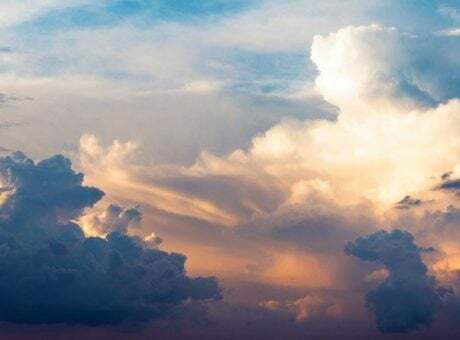 It does this by adsorbing all the build-up and impurities that coat our hair, from hair products to minerals in water and pollution in our environment. The clay is primarily beneficial for gray hair but it really can be used for any hair color. QuickSilverHair Oil is made of hair nourishing oils like argan oil and jojoba oil that help maintain a healthy scalp and a stimulated hair follicle. The oil was actually based off a tried and true recipe I had come up with while working for my mom. I had been using it for frizz control and as a hot oil treatment, for 20 years. The clay needs oil to activate so it is really a tandem product; however, it can be used in more ways than one. The oils in the blend were specially selected for scalp healing and healthy hair. 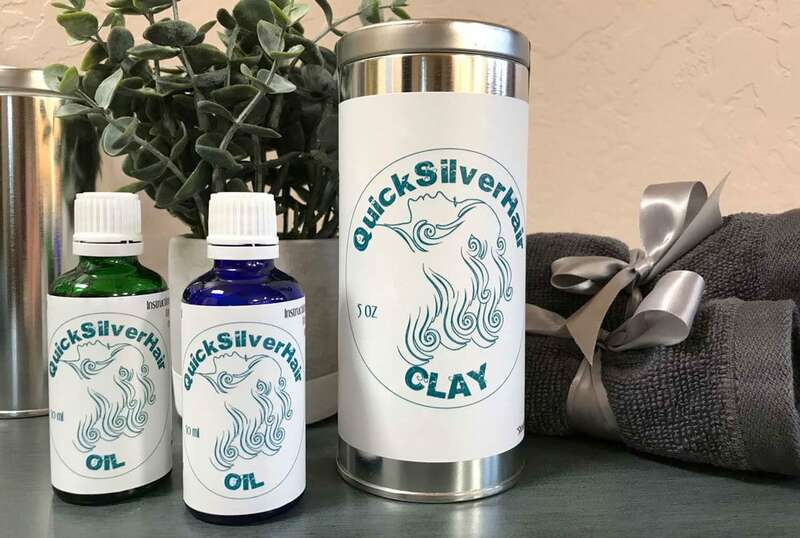 QuickSilverHair Oil is especially beneficial for anyone with inflammatory skin conditions, acne, psoriasis, and dry skin. We are finding impressive results: my husband suffers with scalp psoriasis, and the oil greatly reduces the skin irritations. I have had people tell me they have used the oil for insect bites, acne, sunburn, aromatherapy for calming, anti-inflammatory for rashes and eczema, and the list goes on. You can read more details about the natural and organic ingredients and their healing properties here. 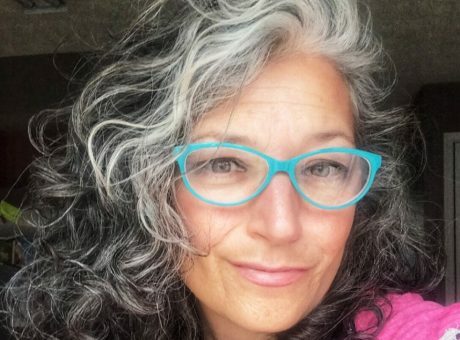 Is the “gray hair is coarse and/or wiry” rumor just a myth or does your hair texture change when you go gray? The short answer is that it is a myth but your texture does change. I hear this myth all the time and read it in articles on caring for gray hair, and I am astonished how often it comes from hair stylists. 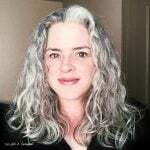 I have had hair stylists touch my hair and say that gray hair is coarse and wiry, which makes me think they must have sensory deprivation issues. My hair is very fine, silky soft, and very prone to the curl falling out rather than being frizzy or wiry. Hair actually becomes finer and thinner as part of the natural aging process. When you dye your hair, you rough up the cuticle and damage the hair shaft. This damage actually causes your hair texture to change. Some notice changes in curl pattern (curlier or even straighter), and all dyed hair can have a tendency to be fragile, dry, frizzy or dull. This can all be due to the disrupted shaft. When you have no dye on your hair, the cuticle closes up more and the shaft can become smoother. 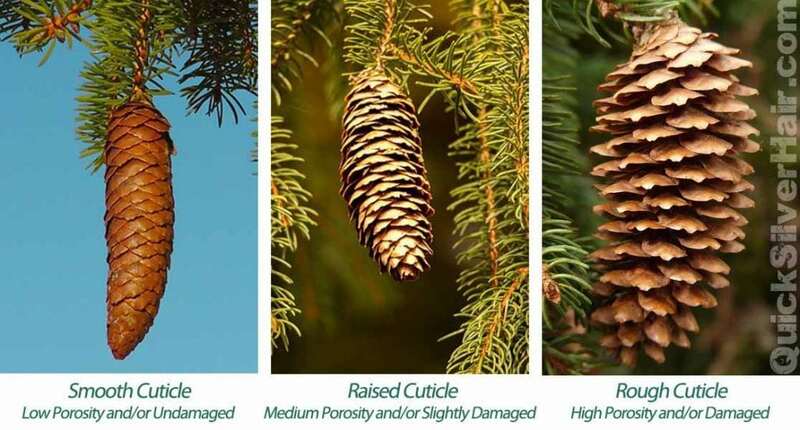 I often use a pinecone to illustrate the point: a dry pinecone is open and fluffy, while a wet pinecone is closed and the individual petals smoothed out. This is your porosity. Porosity can dictate more about your hair texture than any other external factor. When you ditch the dye, the porosity of your hair can change and that is what you will focus on treating as you embrace your natural uncolored hair. 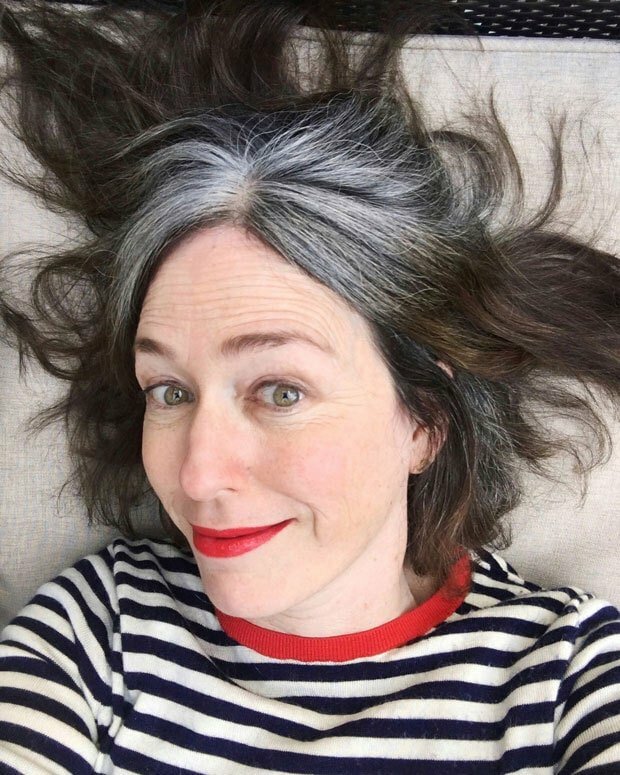 I wrote a more in depth blog on this topic and several more Silver Hair Myth Busting topics. Are you planning more products (or projects) for gray hair in the future? I think that will probably be the natural evolution of the brand. I am already thinking about making the clay into a premixed mask for those who do not want to be bothered with the kit. OK, first off, let me tell you that the QuickSilverHair Oil smells fantastic. It smells fresh and outdoorsy, not like chemicals or heavily-scented perfume! As many of my silver sisters know, our new gray growth often comes in kind of wiry – it sticks straight up! I used the oil to smooth down that frizz, and it really worked. The next morning, I decided to try the clay. I followed the directions provided by Joli and made a paste that was the texture of frosting. (Note: My best results yet came when I mixed the clay with BTWCo. Daily Moisturizing Shampoo). I applied it to my clean, wet hair, covered it with a shower cap and set a timer for 20 minutes (I wanted to do 40 (the max time) but I was on my way to #LAGreekFest and running late). The clay was easy to rinse out. Shampooing is optional, but I decided to use a little shampoo just for the heck of it. Wow – my silvers looked MUCH whiter! 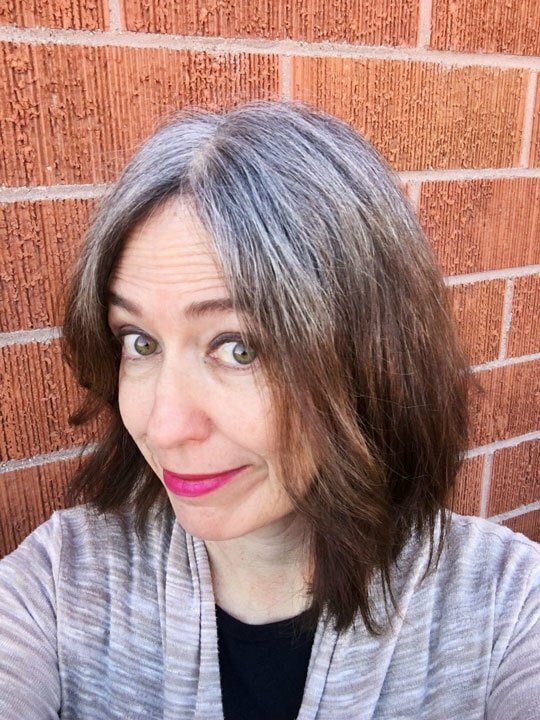 The Overtone that I had used the week before had darkened my silvers a bit, and the clay brightened them back up (which I wanted!). Who would ever have guessed that I would LOVE to have white roots? Now, you are probably wondering – where are your Before & After Photos? Well, I will have to do a reshoot soon because the photos I took did NOT come out (bad lighting in my house and I didn’t have time to fuss with it if I was going to make it to my LA Greek Fest volunteer shift on time). 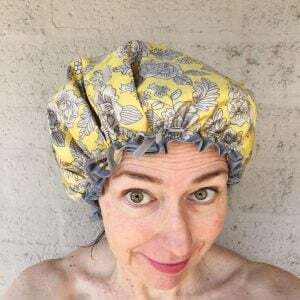 But here is a goofy photo of me in a shower cap, which I wasn’t going to share because it is SO unflattering, but I feel like I should give you at least one photo of me QuickSilvering! In the meantime, here is a Before & After Photo of another of Joli’s clients (Katherine), which bears out what I experienced. My whites are noticeably whiter today. And I took this photo yesterday – I didn’t use a filter, and took the photo in natural light, so you can see how WHITE and clean my roots look. I love it! Get a load of that lovely silver! Woo-Hoo! Does she imply this will get rid of purple stains too? Will it help with sun or heat damages hair? If I could get my hair as white as that photo I would dance a jig! Lol. Hi, I’m not sure, but here is Joli’s QuickSilverHair FAQ page that might give you some answers: https://quicksilverhair.com/faq/. And you can always email joli directly through her site if you can’t find your answer there. Thanks! Where do you purchase – need this ! Excited to try this product. Thank you Ladies!! Your silvers are so sparkly❄, I want to be sparkly too 😉! Thank you Ladies for this post and the time taken to create such a product. I’m excited to try it. Where can I get it? Jolie can you recommend a good shampoo for my curly silver hair as well? I’m totally buying some today! WHAT A GREAT REVIEW KATIE! Thanks, Jonie!! I know you will love it!